Over 400 well-dressed ladies and gentlemen took to their cycles in central London for the second annual Tweed Run on Saturday, April 10. Fine spring weather greeted the assembled cyclists, suitably attired in smart suits and pretty frocks – many with authentic period cycles. 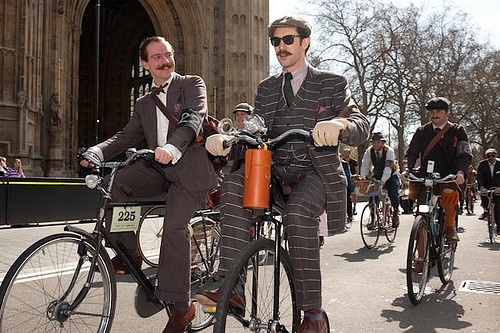 The Tweed Run is a fun cycling event in central London, where participants are expected to sport authentic 1920s or 1930s clobber, including tweed, plus fours, cravats and caps. Pace along the 14-mile route could be described as leisurely, with a highly civilised tea break along the way. Riders can take in the sights of Trafalgar Square, Big Ben, Buckingham Palace and St Paul’s Cathedral en route. After last year’s inaugural Tweed Run spawned copycat events around the world, the London organisers are hoping to take the event to Toronto, Canada later this year.